With the rapid growth of streaming services like Spotify which has dramatically changed the way consumers perceive buying and consuming music, Apple’s once great iTunes business model has been in decline for years. It is imperative for Apple to move into the music streaming space. Apple Music emerges in response to this situation. Since the release of Apple Music, it continues to get more popular, which seems like one of the most compelling rivals yet for Spotify. Now, let's us make a side by side comparison bewteen Apple Music and Spotify to see which one is better for you. 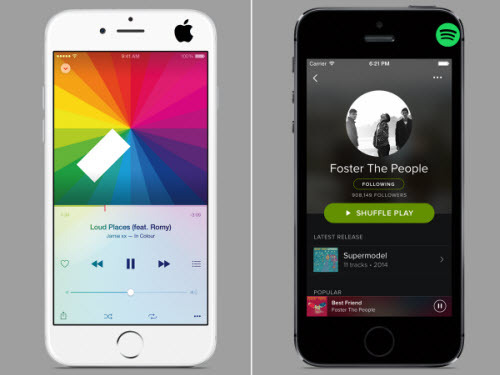 First, let us look the quick guide to the differences and similarities of Apple Music and Spotify. Both services are $9.99 per month. Both services offer family plans that cover up to six people for $14.99 per month. Both services provide student plans for $4.99 per month. Apple also offers a $99 per year plan for single subscriptions. This plan makes the monthly rate $8.25 per month. Spotify has offered this plan on occasion in the past, but it’s just a promotion (instead of an ongoing pricing plan). In the end, both services are around the same amount of money per month. If you are buying a single subscription, Apple’s $99 per year plan is the way to go. Apple Music has a single standardized 256 kbps sound option, in AAC format, whether you are paid user or free user. Spotify, on the other hand, separates its sound quality according to whether you are paid user or not: 96 kbps and 160 kbps on its free version, and 320 kbps on the paid version. Some people may draw the conclusion that the Spotify Premium version offers better quality music than Apple Music. In fact, it is a misunderstanding. Apple Music is streamed at 256Kbps in AAC (Advanced Audio Coding) format, while Spotify offers the Ogg Vorbis format at 320Kbps. The two compression formats aren't directly comparable by bit rate alone. Suggestion: Which one is better is up to your ears. Both Apple Music and Spotify try to understand your music preferences to serve up recommendations, but they work in different ways. Apple Music uses the Beats Music recommendation engine to learn what you like and continually find new suggestions. The "For You" tab will fill up with constantly evolving recommendations according to your favorite artists and genres. Unlike the prominent “For You” section of Apple Music, the Spotify’s Discover section is buried in the Browse tab, which tailors recommendations based on your listening history. Suggestion: In Spotify, list 20 albums and be familiar with only 6 of those 20. In Apple Music, list mainstream artists such as Coldplay, Elvis Presley, and Robert Johnson. Apple Music wants to make a big splash in radio. 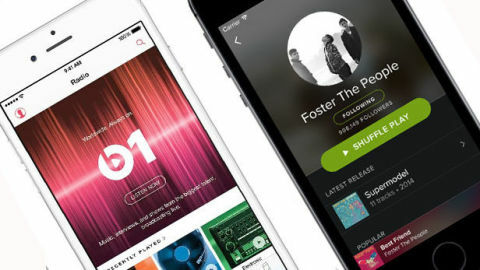 Apple Music will offer Beats 1, streaming from London, New York and Los Angeles. The Beats 1 promises to be an always-live radio station where DJs will broadcast around the clock not only to play great music, but also to discuss what's hot in music and music culture and offer exclusive interviews. Spotify, does not have live radio, but it enables you to create stations based on your favorite artists, genres, songs, playlists or albums, and the service will find songs to match. These radio stations are the top priorities of Spotify now. Suggestion: If you are fond of listening Radio, Apple Music is your top choice.